Recently, there’s been a sudden surge of popularity in fireproof gun safes. If you’re unfamiliar with fireproof gun safes, it’s basically a safe that has certain qualities and aspects that make it fireproof. But, are fireproof safes really as protective as they seem to be? There seems to be a lot of myths surrounding gun safe fire ratings. So, we’re here to debunk them. That being said, continue reading to learn about seven of the most popular gun safe fire rating myths that you should stop believing! We wish we could say this isn’t a myth. But, unfortunately it is. While manufacturers will market fireproof gun safes as being completely fireproof, the reality is there is no way it can entirely be fireproof. This makes sense when you take a second to think about. After all, guns are potentially harmful fire arms that can set off and cause damage just from a change of pressure. So, do you really think there’s a way to completely protect your guns from fire? The answer is no. Manufacturers have people scared straight about fire. But, the truth is the chances of your guns being stolen are a lot higher than your chances of your guns burning. According to research, there are less than 400,000 house fires in a year. This is easily compared to the almost 3.4 million burglaries that are completed or at least attempted annually. Just from these statistics, it’s easy to see that you should be worry about theft more than you should worry about fire. 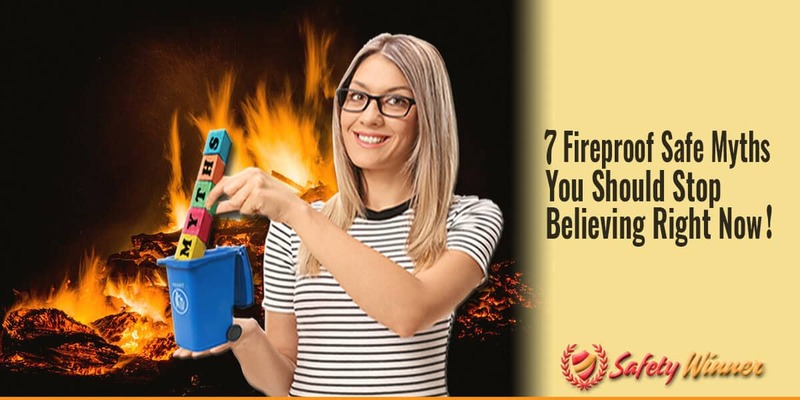 Many people are surprised to find out that home fires are actually a lot more damaging than they seem. In fact, home fires can start fairly quickly and cause damage within seconds. Research shows that home fires can rise up to 1300 degrees Fahrenheit within the first few minutes. Of course, 1300 degrees Fahrenheit can damage anything, even a gun safe that claims to be fireproof. It’s also interesting to note that most home fires start in either the kitchen or a bedroom. Interestingly, these are two of the most popular places to install a gun safe. So, it’s safe to say that your fireproof gun safe isn’t as secure and durable from home fires as you may think. Okay, we’ll be honest: this isn’t necessarily entirely a myth. But, there is some faulty logic to this. Just bear with us. If home fires are most likely to start in a kitchen or a bedroom, then you most likely don’t want to install your gun safe in those areas. That leaves the basement as a somewhat decent place to install your gun safe. While basements are safe in the sense that a fire will most likely not start there, it’s important to note that the basement is one of the most at-risk places in your home in the event that a fire starts. This is because the basement acts as the foundation for your home. So, although it is one of the last places where a home fire will spread, once it accumulates in your basement, the area is extremely dangerous. Your basement also houses stuff that is of critical importance to your home and safety, such as your electric, which could cause a larger fire and more damage if it’s effected. The basement is also one of the hardest places to clean up after a fire because toxic water usually accumulates there after a disaster, such as a fire. Obviously, these are all important aspects that influence whether o not you truly should place your gun safe in your basement. One of the most foolish things you can do is storing your ammunition inside your gun. Many people believe that a gun only shoots ammo if the trigger is pulled. While things, such as a safety, stop a gun from being used improperly, other things can set a gun off. Essentially, guns fire through air pressure. When there is an increased amount of hot pressure, a gun will fire regardless of whether or not the trigger was pulled. Of course, fires create an influx of hot pressure. Therefore, if there is a fire, hot pressure will be created, and your gun will fire. That being said, you should always make sure to unload your gun when it’s not in use. The best way to store your ammo is by purchasing a special container for your ammo, then storing it inside your fireproof gun safe. Despite common belief that your guns will stay safe during a fire as long as the temperature in your gun safe stays below 350 degrees Fahrenheit, there is no research that supports this claim. Ultimately, the safety of your guns and other objects within your safe is ultimately dependent upon a few factors. Firstly, if you store any cleaning chemicals in your safe, then there’s more of a risk of a fire starting if there’s a sudden rise in air pressure or temperature. It’s also important to note that different fire arms and objects have different heat capacities. You should take these into consideration when determining what temperature to keep your gun safe at. If you’re unfamiliar with UL, it stands for Underwriters Laboratories. Although many people consider a UL rating the same as the fire endurance capacity, it actually isn’t. Ultimately, a UL rating is very vague. In fact, it could mean almost anything. For example, if something is UL rated, it could simply mean that the manufacturers paid for UL to test the product. Therefore, a gun safe UL rating isn’t something that you should take into deep consideration because it could mean a variety of things. Ultimately, it’s just a flashy label that propels people to purchase a product.